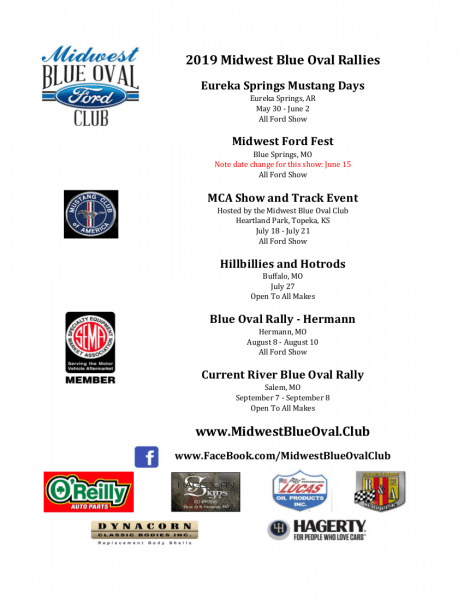 The Midwest Blue Oval Club’s 2019 schedule is now official. We have added a sixth show in Topeka KS. If you have enjoyed our shows in the past, you certainly do not want to miss any of them this year. We are working on expanding and improving each show. Stay up to date by checking the events section often as each show is updated. Each show will have its own section under the events tab. We hope to see you at one or more of these shows this year. Please note that we had to change the date on the Midwest Ford Fest show due to a conflict with another large show. The new date is June 15, 2019. To get to the 2019 Eureka Springs Mustang week quickly, click here.